5Dimes was established in San Jose, Costa Rica and launched in 1996. The online sportsbook has since made a name for itself by providing user-friendly betting lines on popular sporting events around the world. They boast to offer more betting lines than any of their competitors while delivering a high-quality betting service to their customers. Since their initial launch, 5Dimes has built a well-respected reputation in the online sports betting community and has since become a leader in the industry. Today they are known as a trusted sportsbook that provides a top-quality betting service to many countries around the world. Our sportsbook reviews are unbiased as we only wish to direct you to the best online sportsbooks that are available to Filipino residents. Is It Legal For Philippine Residents To Place Sports Bets At 5Dimes? Yes, there are no Philippine gambling laws that state legally licensed offshore sportsbooks are illegal. Filipinos can legally place bets on any sporting event offered online with the use of offshore sportsbooks if they are legally licensed and in compliance with their local gaming regulators. To see additional online sports betting options, visit our Philippine online sportsbook reviews page. Filipino gambling laws clearly state that Philippine residents are not allowed to use any domestic online sportsbooks. Since this is the case, many Filipinos turn to legally sanctioned offshore sportsbooks to get their wagers in on PBA games and other popular sporting events. 5Dimes is currently licensed by the Government of San Jose, Costa Rica. Since their inception, they have maintained a good status with the local regulators, and hold compliance certification records to show it. The Government of Costa Rica has issued licenses for several top-rated online sportsbooks and provides sportsbook users with a sense of security knowing that the sportsbook has been audited and is frequently investigated for compliance with fair gaming practices. The betting lines provided by 5Dimes are known as some of the most favorable betting lines when using the reduced juice option. Even without the reduced juice option, the betting lines are better than most of their competitors. Philippine residents will be happy to find PBA betting lines, and a variety of other Philippine sporting events that can be wagered on. 5Dimes has some nice bonus offers for new accounts and returning players. The reduced juice option is regarded as one of the site’s best sportsbook features and is why many seasoned bettors use 5Dimes regularly. While there are other bonuses and promotional options, we will take a quick look at some of the popular sportsbook offers at 5Dimes. 50% Plus New Player Reward – This welcome offer is good for up to $520 in free play rewards. Any deposit between $100-$400 will receive a 50% free play reward, and if the deposit is over $400, it will receive an extra 20% free play reward. Players must request this reward within 24 hours of their initial deposit. Reduced Juice – A rewards plan that offers better betting lines on football, basketball, baseball, hockey, golf, tennis, boxing, and more. The reduced juice reward program will lower a betting line to make it more user-favorable on any of the qualified sporting events. It’s not just a one-time thing, you can get this reduced juice reward and use it hundreds of times during the life of the account. 20% Cashback Reward – Earn up to 20% cashback on losing bets with this reward. This option is good for twice a year, but additional terms and conditions apply. 30% Super Saver Reward – This reward is great for users who like to bet on football, basketball, or baseball and includes expanded parlay payouts. This program offers an instant 30% pricing discount on sports wagering. Does 5Dimes Offer Any Other Types Of Gambling Options? 5Dimes also has an online casino, poker room, and a racebook that account holders also have access to. The 5Dimes casino has over 200 games, a live dealer option, and is a nice addition to their extensive sportsbook. Horse race betting is available through the 5Dimes racebook, and they offer some nice rewards for using this feature. The poker room offers a bunch of tournaments, and low buy-ins but when compared to other online poker sites, it falls short on features. 5Dimes has a mobile sports betting feature that allows users to check betting lines, and wager on sporting events from mobile devices, smartphones, or tablets. The mobile platform is similar to the desktop version and offers all the same features. Account holders have access to banking options, sports wagering, betting lines, and more from their mobile device. 5Dimes is designed with a responsive web-based technology. The responsive design technology assures operators that the website will display correctly on multiple size devices and that there is no need for an application download. 5Dimes has a few options that set them apart from other online sportsbooks such as BetOnline.ag or Sportsbetting.ag. The reduced juice bonus option is the most notable and player friendly option available at 5Dimes. When using the reduced juice bonus, sport betting lines become more favorable to the user. Not many sites have this option and if you bet on a lot of sports matchups, this is a great perk for you. 5Dimes also offers different betting services such as casino betting, live dealer games, horse race betting, lottery, and poker. Live betting at 5Dimes is one of their top features, and it allows their players to bet on the action as the game or matchup is taking place. 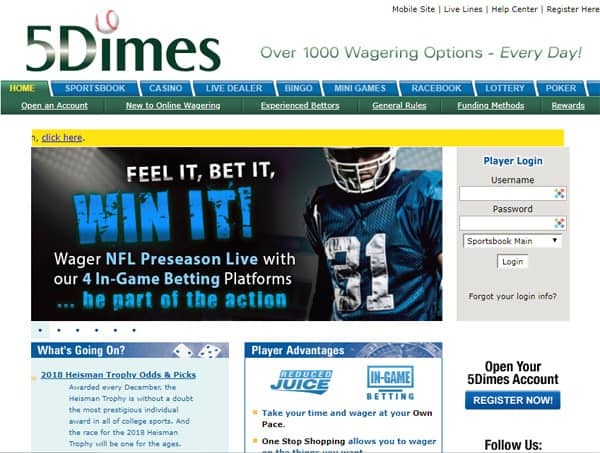 There are four tiers to the live betting platform at 5Dimes; live in-play wagering, live betting ultra, live betting extra, and sports betting prime. Each tier has its own set of rules and features different live betting options. Live betting odds are usually updated during commercial breaks or in between rounds. While 5Dimes doesn’t accept the Philippine peso, they do offer many ways to fund an online sportsbook account that make using Pesos possible regardless. Below you will find all of the banking options available at 5Dimes sportsbook. Our industry professionals recommend using Bitcoin because it is easy to buy and has the fastest turnaround times when using online gambling services. Pros and cons differentiate from player to player. Here is our opinion of the best and worst features that 5Dimes sportsbook as to offer. Customer service at 5Dimes is a top priority, and they offer three ways to get in touch with a 5Dimes representative; phone, e-mail, and live chat. The live chat feature is the fastest way to get any sportsbook related questioned answered. By clicking on the live chat icon, a window will pop-up where you are immediately connected to a customer service representative. The phone option is very specific as they offer nine phone numbers for several different reasons.